Dr. Goldenberg is a New Beauty Expert – Updated profile and website! With affiliations with Mt. Sinai, one of the top medical institutions in the world, Dr. Goldenberg is equipped with both the background and skills necessary to treat a host of dermatological conditions, both medical and cosmetic. 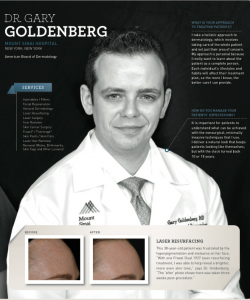 Dr. Goldenberg is highly experienced in cosmetic treatments and his eye for aesthetics helps him get effective, natural looking results for his patients. 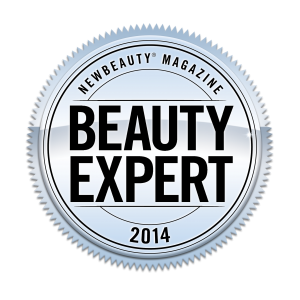 Dr. Goldenberg is board certified in both dermatology and dermatopathology and has appeared many times on television to talk about the current developments in the field of cosmetics. Cosmetic procedures are more common nowadays than ever and when performed by skilled medical practitioners, the results can make plastic surgery unnecessary. When choosing to improve your look with Dr. Goldenberg, you can rely on his years of experience with standard injectable fillers, relaxing agents, chemical peels, and cosmetic lasers. Wrinkles are perhaps the most common issue that women and men want treated as they age. A result of degenerating skin tissues and the constant pull of gravity, wrinkles are not something that can come and go as other types of issues may. However, there are many effective options for dealing with wrinkles and reducing their appearance while maintaining one’s natural look. Injectable fillers work by directly reducing the depth and texture of creases in the skin. A fine needle is loaded with a harmless filler compound and deposited into the dermal layer of the wrinkle. Based on a protein found normally in the skin, this synthetic enhancement is known to last longer than that naturally produced by the body. These compounds degrade naturally over time and may last up to a year, during which time additional injections can be safely performed by Dr. Goldenberg. Some compounds, such as Radiesse, also have the ability to stimulate increased collagen production in the injected areas. Wrinkle relaxing agents are compounds that affect the muscle affecting the appearance of wrinkles. The most popular agent, Botox®, and Dysport are chemical compounds that forces the underlying muscles of the skin to cease contraction. This allows the skin to relax without folding over itself, reducing the appearance of wrinkles during facial gestures. Harmless when administered by the proper hands, consult with Dr. Goldenberg if you believe Botox can relieve you of your wrinkle worries. Chemical peels are recommended by Dr. Goldenberg to some patients with modest amount / depth of wrinkles. The peels also improve skin tone and texture. A solution of trichloroacetic acid (TCA) is applied directly to the skin and is allowed to sit for a specific amount of time. This forces the most superficial layers of skin to become detached, allowing them to peel off while removing large amounts of dead skin, dirt and debris, and clearing many pores that may otherwise result in acne. Chemical peels are a great treatment for those trying to achieve that vibrant, fresh look. Finally, lasers are an option that has become commonly used for treating a large number of issues. This is due to the high precision and effectiveness of lasers, and the fact that there is no need for surgical invasion. For cosmetic treatments, lasers can target specific areas of the skin to eliminate culpable cells or stimulate the synthesis of cellular compounds. It can be used to treat wrinkles, reduce the appearance of scars and discolorations, treat redness and acne, and more popularly, used for hair removal. Dr. Goldenberg sees lasers as an alternative to surgical methods, providing an option unlike any other to alter and improve patients’ appearance. Unlike other offices, Dr. Goldenberg personally performs all laser treatments in order to maximize the benefit of each device and combine/switch therapies when needed. Contact Dr. Goldenberg at (212) 241-9728 if you have any cosmetic concerns that you would like to see treated. With an impressive background in medicine and countless satisfied patients, you can be sure that you are in the best hands for your aesthetic enhancements.